New analysis by ALTER-EU shows that when it comes to lobby transparency and preventing privileged access by big business lobbyists, the Juncker Commission still has a long way to go. President Juncker's proactive transparency rules do not ensure transparency of meetings with lobbyists, as ALTER-EU analysis shows. Up to 83 per cent of lobby meetings to discuss financial services are held with EU officials not covered by Juncker’s proactive transparency rules, according to data disclosed by DG Fisma (Commission department responsible for EU policy on banking and finance). 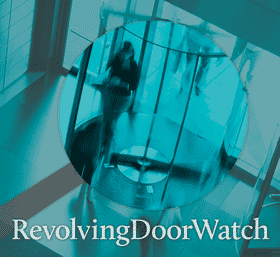 Worse, 92 per cent of meetings with lower level officials in DG Fisma are held with corporate interests, and up to 13 per cent of meetings with EU officials are with unregistered lobbyists. These new statistics illustrate how President Juncker has failed to keep his commitment to make the Commission transparent and ensure an adequate balance between stakeholder interests in meetings. 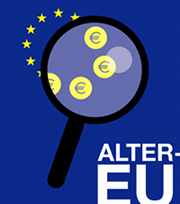 The analysis follows the disclosure by DG Fisma of data requested by ALTER-EU in access to EU documents requests for lists of meetings between lobbyists and EU officials working in various directorates-general of the Commission. 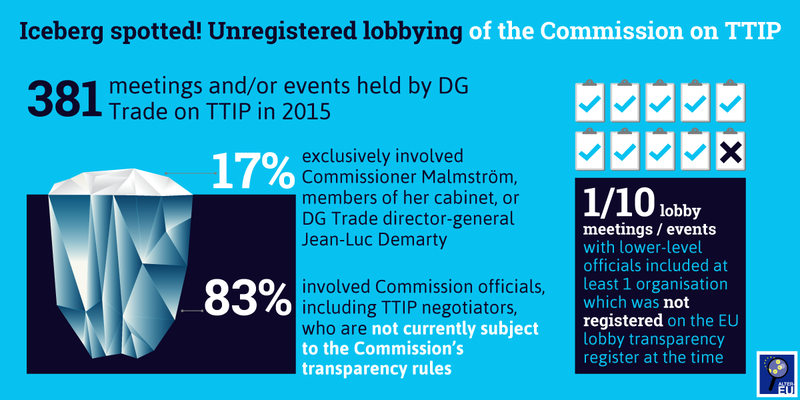 For DG Trade and lobbying on the EU-US trade deal (TTIP) in 2015, one in ten meetings involved an unregistered lobbyist and corporate interests outnumbered public interest groups two to one. The following infographics explain the findings in more detail. We found that of the 519 meetings between January – July 2016 held with Commissioner Dombrovskis, DG Fisma Director General Olivier Guersent, and DG Fisma lower level officials, 81 per cent (437) were held with lower level EU officials that are not required to proactively publish their lobby meetings. Only 82 (16 per cent) of these 519 meetings were held with Commissioner Dombrovskis and/or DG Fisma Director General Olivier Guersent, who are the officials obliged to proactively publish these lobby interactions. Twelve meetings overall were held with governmental organisations which are not required to register in the EU lobby transparency regime. Our analysis exposes a huge loophole in the proactive transparency rules: they only cover 16 per cent of all lobby meetings that we analysed. This is because the rules do not oblige the proactive publication of data on meetings with lower level officials, despite these constituting 81 per cent of all DG Fisma lobby meetings. There is a clear public interest in knowing which lobbyists get access to the 30,000 Commission officials. The huge number of meetings that are not proactively published shows the need to broaden Juncker's transparency measures beyond the top 250-or-so officials – after all, it is not the Commissioner or Director General who draft the reports, impact assessments, directives and proposals that come out of the EU institutions. Only if all lobby meetings are disclosed, will citizens be truly able to find out who is influencing EU policy. 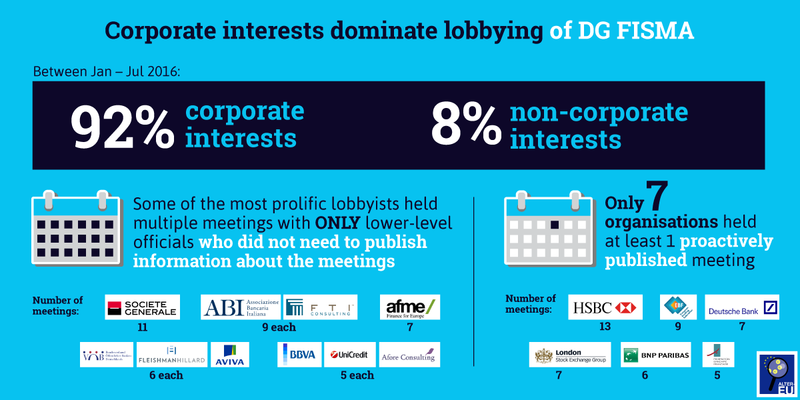 Our analysis of the interests represented in lobby meetings with DG Fisma reveals that officials who have to proactively publish their meetings have held 91 per cent of them with corporate interests (only two meetings were with public interest organisations). When it comes to those officials lower down who are not covered by Juncker’s proactive transparency rules, 92 per cent of their meetings were with corporate interests versus only 8 per cent with public interest organisations. Multiple meetings were held with organisations such as HSBC, Société Générale, Deutsche Bank, BNP PARIBAS, BBVA, the London Stock Exchange Group, the Italian Banking Association, the French Banking Federation, the European Banking Federation, or the Association for Financial Markets in Europe. The vast majority of these interactions were held with lower level officials who are not required to publish information about the meetings. HSBC, London Stock Exchange Group, Deutsche Bank, BNP PARIBAS, European Banking Federation, and Fédération bancaire française held a meeting each with either Commissioner Dombrovskis or Olivier Guersent that was proactively published, whilst the vast majority of their 47 meetings with DG Fisma were with lower level officials and therefore not published, according to the data disclosed. The percentages have hardly changed since our analysis at the end of 2015. 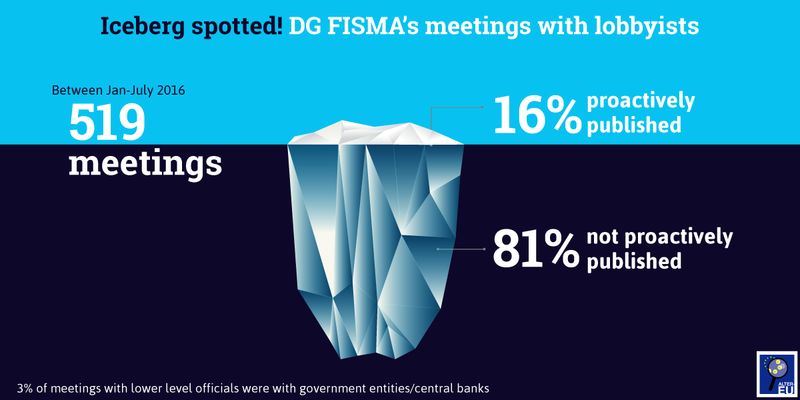 Back then, 90 per cent of all DG Fisma's meetings were with lobbyists representing corporate interests, whilst the analysis from the first half of 2016 shows little change as corporate interests were represented at 92 per cent of meetings with officials. The analysis shows DG Fisma is subject to influence overwhelmingly and almost exclusively from corporate interests. Maintaining a balance in lobby meetings and interactions has been a challenge to all parts of the Commission covered by the requirement to “ensure an appropriate balance and representativeness in the stakeholders they meet". Two years after the Commission’s announcement, it is still not clear how this commitment is monitored or enforced. 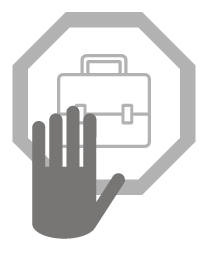 1 in 8 lobby meetings with both high- and lower-level DG Fisma officials from January – July 2016 were with organisations that should have be registered in the EU Transparency Register, but were not at the time of their meeting, according to an ALTER EU analysis of data disclosed by DG Fisma to our access to EU documents request. Shockingly, the research revealed that lobbyists from Motorsport Industry Association Limited (MIA) met with Commissioner Dombrovskis in a proactively published meeting, but the organisation was not registered at the time of that meeting. 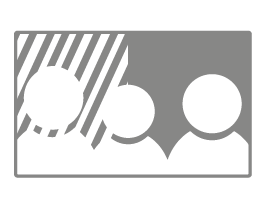 The EU Transparency Register shows that it registered the day after, demonstrating the unacceptable flexibility with which the Commission has interpreted the December 2014 rules which prevent meeting with unregistered lobbyists. The data shows that 68 meetings were held between lower level officials and lobbyists where at least one of the organisations participating was not registered on the EU Transparency Register. 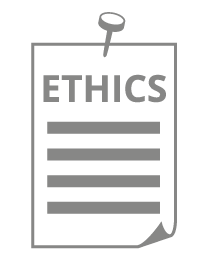 In some cases, the unregistered organisations attend with a lobby consultancy that is registered in the Register, a handy workaround of the rules for anyone wanting to avoid transparency. 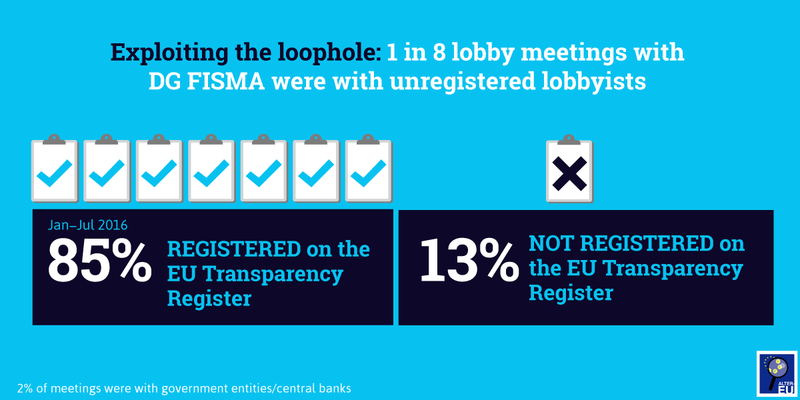 Whilst it is unacceptable that Commissioners break the rules they set themselves on lobby transparency, our research again exposes the loophole in the current rules on not meeting unregistered lobbyists. Whilst the data shows a slight improvement since our last analysis (where 20 per cent of meetings had unregistered lobbyists present), it is worrying that 13 per cent of the meetings held with EU staff in DG Fisma are with organisations that are still not declaring their lobbying activities, despite the fact that they are active lobbyists. ALTER-EU has counted a total of 381 meetings and/or events held by DG Trade on TTIP in 2015. Probably this is an under-estimate (as many meetings are recorded with a very general subject such as “ongoing trade negotiations” or “current trade policy” or similar). Of these 381, 64 appear to have been attended exclusively by either the trade commissioner Cecilia Malmström, or members of her Cabinet, or the DG Trade director-general Jean-Luc Demarty and are pro-actively listed on the Commission’s website. The other 317 meetings and events were provided to CEO as a list through access to documents and they involve Commission officials who are not currently subject to the transparency rules. This means that the meetings / events are not pro-actively published, as these officials, who include the TTIP negotiating team, are not banned from meetings with lobbyists who are not registered in the EU lobby transparency register. According to ALTER-EU analysis, 35 lobby meetings (11 per cent of undeclared lobby meetings held by lower-level officials) held on TTIP in 2015 included at least one organisation which was not in the EU lobby transparency register at the time. Some of these organisations, but not all, have subsequently joined the register, but it is shocking that such important officials in the Commission, responsible for the nitty-gritty negotiations on this controversial trade deal, have held meetings with organisations which have not been transparent about their lobby budgets and affiliations. The European Ombudsman has echoed many of the civil society calls for far greater transparency in TTIP negotiations. Specifically, she has called for the Commission to extend the lobby transparency rules to a far wider range of officials, including the TTIP negotiators. She has also demanded far more publication of documents, including agendas and minutes of meetings with lobbyists. Further ALTER-EU analysis shows that corporate interests (including companies and trade associations) secured double the number of meetings that civil society (a wide category which includes NGOs, unions, academics, think-tanks, and others) secured with the TTIP negotiating team. Top of the TTIP corporate lobby list was BusinessEurope with 13 meetings or events; ACEA, the European Automobile Manufacturers' Association, and TABC, the Trans-Atlantic Business Council, both with 7 meetings or events; and EGA, Medicines for Europe with 5. The pro-corporate bias in lobby meetings held on TTIP by the Commission has long been seen by civil society as a major problem. Industry dominance was even more striking when the direction of the negotiations was being decided and that enabled the corporate sector to see its wish-list largely adopted by the Commission. But today we know that DG Trade is still following a big business agenda, which is, for example, reflected in its take on Investor State Dispute Settlement mechanisms (ISDS). While BEUC, ETUC and other civil society groups have rejected these, the Commission is still pushing ahead full steam, with the support of many in the corporate world. 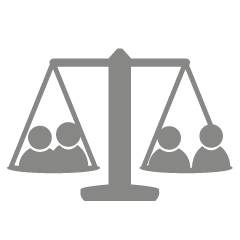 Commissioners have an obligation to “ensure an appropriate balance and representativeness in the stakeholders they meet", although this does not appear to be monitored or enforced. For cabinet members and officials there are no such rules.